Sky-Watcher is celebrating its 20th Anniversary and to help recognize the occasion the company is working with Starlight Xpress to offer limited-edition astrograph imaging packages. Sky-Watcher is matching its line of astrographs with the Starlight Xpress Trius SX-42 camera – virtually eliminating all of the headaches associated with configuring an imaging train. The packages take the worry out of considering back focus, adapters, guiders, filter wheel, etc. – just attach these kits to your mount, plug into a computer, add your filters and you’re ready to go. 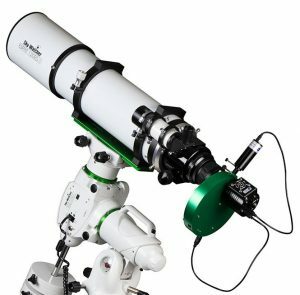 Sky-Watcher’s collection of high-end astrographs include its Esprit ED Super Apo triplet refractors and Quattro f/4 Newtonians. All of the kits include field flatteners to ensure tight, round stars across the entire imaging plane. They also include mounting hardware, 50mm optical finder scopes and dual-speed focusers. The Starlight Xpress Trius SX-42 monochrome camera kit offers ultra-low-noise Sony 694 sensors, excellent QE of up to 77% and built-in USB hub for guider and filter wheel control. The kit also includes a 7-position1¼ inch filter wheel (filters not included), built-in off-axis guider with Lodestar X2 guide camera and convenient, impact-resistant carry case. 20th Anniversary Kits are only available while supplies last.